Died: May 15, 1885 in Bourne Ma. at 76 yrs, 1 mo. Married: June 28, 1828 in Sandwich Ma. 1. Lewis Handy, Jr; (July 21, 1829 – March 2, 1847); Mariner; Died aboard schooner “Science” at 17 yrs, 7 mos, 8 d; Lewis is buried in Cataumet Cemetery. 2. 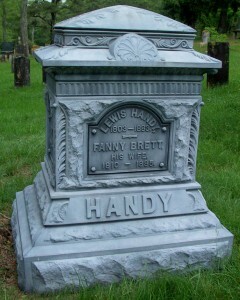 William Handy; (September 16, 1831 – March 25, 1904); Married (1) Susan S. Landers (1837 – 1904) (Samuel Landers & Sarah (–)) on June 11, 1857 in Falmouth Ma. & married (2) Ellen Maria (Downing) Glidden (1853 – 1902) (Silas Downing & Jerusha C. Townsend) on January 25, 1890 in Marion Ma. ; Susan married (2) Franklin C. Blankinship (1850- 1935) (Warren Blankinship & Emily Clark) 0n November 5, 1888 in Mattapoiset Ma. ; Franklin married (2) Angeline F. (Harlow) Baker (1869 – 1957) (Andrew H. Harlow & Julia A. Morse) on March 5, 1908 in Marion Ma. ; Angeline married (1) Chester Alexander Baker (1870 – 1961) (Ozial P. Baker & Marietta Ames) on May 17, 1888 in Sandwich Ma. ; Angeline & Chester divorced; Susan, Franklin & Angeline are buried in Evergreen Cemetery in Marion Ma. ; Ellen married (1) Alonzo G. Glidden (1849 – 1887) (Benjamin Randall Glidden & Mary Lincoln (Manuel)) on July 12, 1876 in Middleboro Ma. ; William, a Mariner, died in Marion Ma..
3. Jason S. Handy; (August 2, 1833 – September 12, 1851); Mariner; Unmarried; Jason died at 18 yrs, 1 mo, 10 d.; He is buried in Cataumet Cemetery. 4. Susan Frances Handy Griffith; (December 29, 1835 – January 7, 1909); Married James W. Griffith (Abt.1830 – 1898) (Wilson Griffith & Jane B. Cole) in Sandwich Ma. 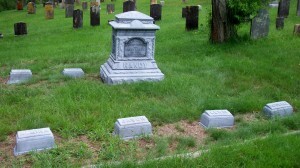 on February 20, 1855; Susan & James are buried in North Carver Cemetery in Carver Ma..
5. Almira B. Handy; (July 30, 1838 – April 15, 1855); She died at 16 yrs, 8 mo, 16 d.; Almira is buried in Cataumet Cemetery. 6. Pliny Brett Handy, Capt. ; (October 16, 1840 – September 5, 1916); Married (1) Phebe/Etta H. Ellis (1849 – 1881) (Anson Burgess Ellis & Harriet Newell (Howes)) in Sandwich Ma. on August 20, 1874; Pliny married (2) Carrie B. Ellis (1854 – 1923) (Nathan B. Ellis & Joanna P. Bourne) in Bourne Ma. on June 3, 1886; Phebe/Etta is buried in Cataumet Cemetery; Pliny & Carrie are buried in Riverside Cemetery in Fairhaven Ma..
7. Charles Pollard Handy; (January 23, 1843 – May 11, 1913); Married Harriet Isabel Weekes (1845 – 1943) (Lewis Thatcher Weekes & Lydia Cleaveland Sandsbury) in Sandwich Ma. on June 20, 1869; Charles & Harriet are buried in Cataumet Cemetery. 8. Roswell T. Handy; (May 23, 1845 – September 13, 1846); Roswell died at 1 yr, 3 mos, 22 d.; He is buried in Cataumet Cemetery. 9. 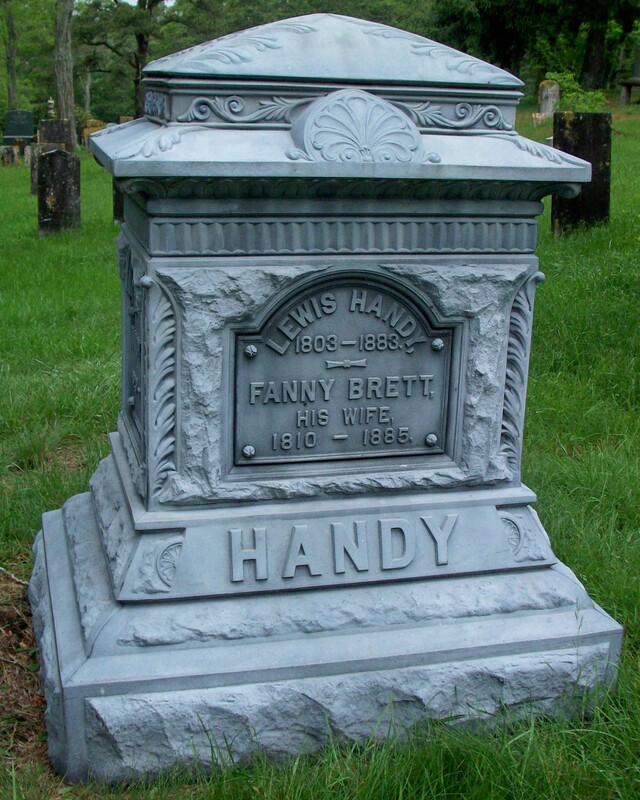 Fannie Lewis Handy; (May 18, 1848 – November 6, 1930); Fannie died at 82 yrs, 6 mo, 19 d.; She is buried in Cataumet Cemetery.